Do you want to make sure that a qualified group of doctors hears your message loud and clear? Buy our physician database of audiology specialists and market your hearing aid or device more effectively. Our audiologist email list is ready for you to download right now! Encourage a new group of specialized doctors to listen to you as you complete medical marketing outreach. You may want to zero in on your marketing approach by targeting a group who work with deaf patients daily. But how can you find the contacts you need? Have you heard about our ready-made doctor databases? First, download this hearing specialist email list. Then, start emailing ear doctors. It's that simple. Use our audiology email database to find the exact network of doctors who need to learn about your products or services, whether you're showing off new cochlear implants, a program for low-hearing patients, or a helpful pharmaceutical or device. This is the ideal way to reach audiologists; email lists like these allow you to cut through red tape and speed up lead-generating because we've done the work for you! Our audiology email database consolidates an array of practices, pulling the contact information all together into one specialized doctor list. 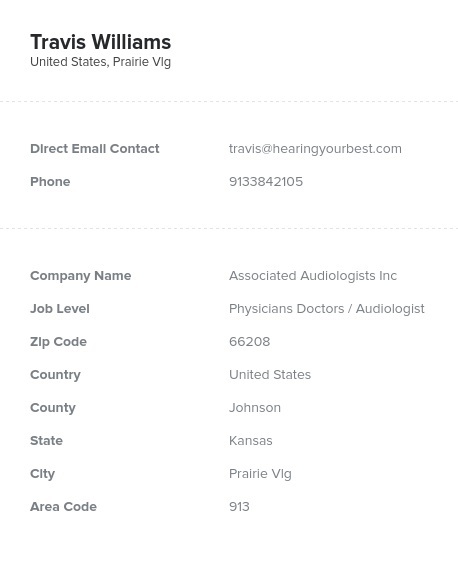 It has a lot of information (including ear doctors' emails, numbers, addresses, names, and even fax numbers), so you can use this one product as an email database, phone directory, and mailing list of audiologists. Start emailing, calling, or sending mail to audiologists about your amazing hearing-loss solution. Within a few minutes of your purchase, you'll have an ear doctor email database that will help you reach out to a normally spread-out group of hard-to-reach contacts and their patients. Buy it now!